Over the years, fishing seminars have been a great way to learn how to become a better angler. Most seminars are filled with “how to” information from area guides and fishing experts. These events are commonly organized by area fishing clubs and other groups of fishermen. Bigger seminars have been made available by fishing magazine’s area tackle shops and made them as special events. In recent years this concept has started to see a number of radical changes. This is actually due to the popularity of using fishing seminars as special and promotional events. In many cases these free events featured a local guide or guides speaking on “his or her” way of fishing for a specific species. This same format has been seen to evolve into seminars that presented a larger number of speakers and drew greater attendees that include a charge. With the recent appearance of the digital age, fishing seminars have started seeing significant change. Many previous seminars are now provided online. This method allows the seminar producer to reach a far larger group while expanding their geographical foot print to markets beyond the local audiences. It allows the attendees to view the seminar without the inconvenience of travel and having to see the seminar at a specific time. It also allows the presenter to provide an improved presentation with the ability of video editing. Best of all it broadens the options of speakers without being limited to the local speakers which, many times, makes the same presentation over and over causing the attendees to lose interest. 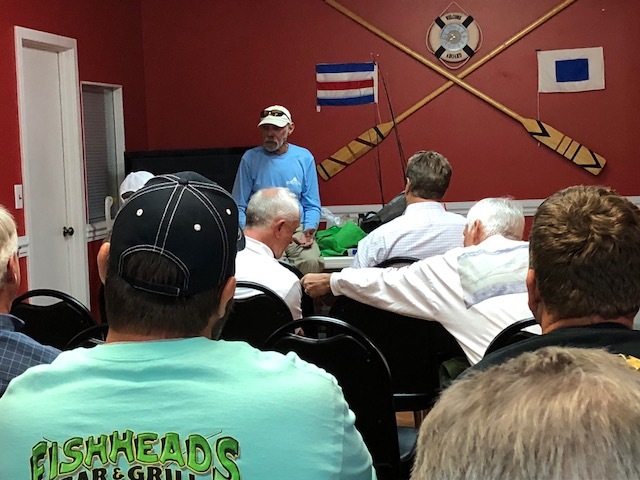 The past seminar patrons seemed to have been attracted to the events to hopefully identify a fishing location that a guide may mention, or a specific lure used by that guide with far less attention to the mechanics of learning to be a better angler. Other benefits to the digital on-demand seminar method is the flexibility that is gives attendees with the increased use of mobile devices. Now anglers can enjoy a fishing seminar while they wait for an appointment or even lounging on the porch on a summer evening. It has also proven to be a popular way to share your latest fishing advice with friends by simply sharing the on-demand seminar link. Binge watching fishing seminars has also quickly become a popular trend. Since most of the seminars can be found on YouTube, you can better determine what you want to watch by knowing the number of views and therefore the popularity of the video. The on-demand concept does a have a few draw backs. First would be the inability to have a face to face presentation that includes a Q&A session. This problem is being addressed by the ability to email or text the questions to the presenter, while it may require a slight delay. This inconvenience is sharply outweighed by the many conveniences of the method. The growing popularity of on-demand seminars has worked to improve the quality and allows a great ease of access. At the same time, it has also worked to improve the popularity of fishing schools that include a more organized format and higher level of speakers. Digital access has changed the way we gather information and communicate, and fishing is another example. See you on YouTube.